I am always buying paper, often in pads, for one project or another or just because I come across an interesting paper or because something is on sale. And, then, it goes in inventory until I come across it later and do something with it. 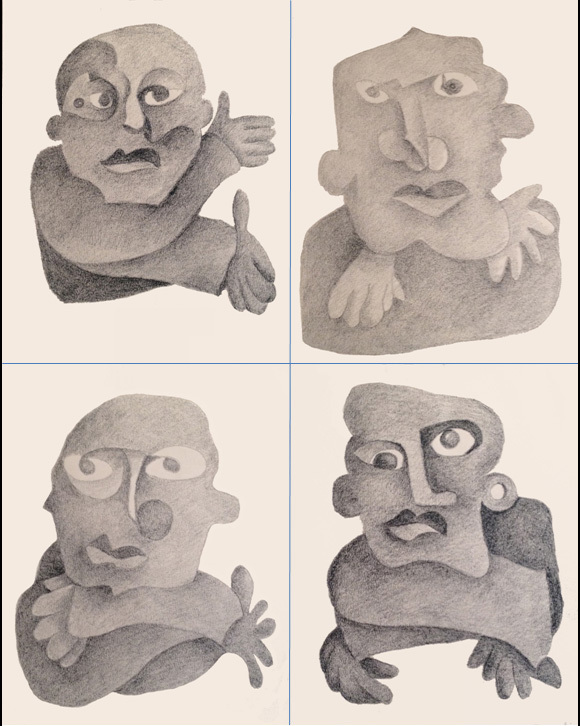 These four drawings are an example. I found a pad of Strathmore 11 x 14 80 pound pastel paper with four light tan sheets left. It had an interesting texture and the cover sheet said that it might be suitable for crayon as well as regular and oil pastels. I also had a bunch of William Korn litho crayons. I’ve used them before to interesting effect. So, I made these four drawings using a No. 4 crayon. I was more interested in texture and value than in form. Obviously, hue and light were not issues. Who are these stylized beings? They are a quartet. Who knows? Too bad that I did not have six sheets. I could have called them “quarks” and named them “charmed and strange,” “up and down” and “top and bottom.” After all, I once did a drawing of a Higgs Boson. More to the point, always keep paper around and use different, even unorthodox materials. Happy New Year. And, thank you for following this blog over the past year, for your comments or, if appropriate, shaking your head and wondering what is with this guy. This entry was posted in Uncategorized and tagged drawing, litho, particle, pastel paper, physics, quarks, spontaneous. Bookmark the permalink.